James and Samantha chose to marry and have their beautiful wedding reception at Borgo di Castelvecchio www.borgodicastelvecchio.com – Via Castelvecchio, 53040 Contignano, Siena, Italy. Borgo di Castelvecchio is situated in the middle of a huge property at the centre of the Val d’Orcia, very near Radicofani, Pienza and Montepulciano. This area of Tuscany it’s the location of the new TV movie “I Medici: Masters of Florence” where it’s possible relive the history of I Medici family at the time of the Grand Duchy of Tuscany, in the Renaissance towns of Montepulciano and Pienza. Around Borgo di Castelvecchio you can see the sets chosen by the directors – Frank Spotnitz and Nicholas Meyer – for the TV series to learn about the history of the famous Florentine family performed by award-winning actor Dustin Hoffman and Richard Madden, an acclaimed interpreter of Game of Thrones. 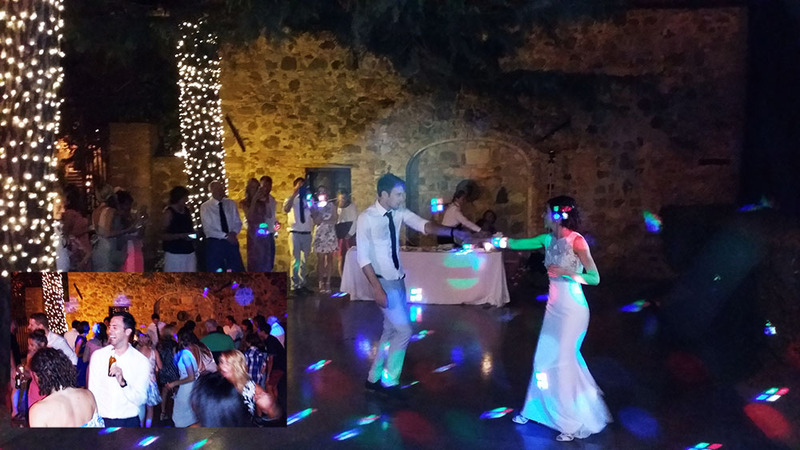 All the wedding took place within the property, the ceremony, the aperitifs, the wedding dinner and the after dinner party with Guty & Simone band, the Italian wedding musicians. The musicians did their usual service of live music + dj sets during the breaks. As usual they also provided an extra sound system and a wireless microphone for the background music and speeches during dinner in the courtyard and some disco lights for the party on the dance floor under the big trees. Samantha’s dad’s side of the family are Jewish so they asked to do the chair dance; actually no wedding is complete without the Hora, or chair dance. As in this tradition, a few strong and brave guests hoisted the bride and groom high above the crowd on chairs to the sounds of “Hava Nagila” played live by Guty & Simone (they already knew this song since they had learnt it before for previous Jewish weddings). Friends and family danced around in an ecstatic circle as the elevated couple tries not to fall down!!! !